(1) My dad’s tutor’s no joker, and he told me the TMA’s going to hit home with a bang. You turn to find the face behind the voice but the person has gone, leaving you to ponder what was said. Let us call this utterance example (1). [Note that we are not referring to sentences here, as we are concerned with spoken language (i.e. spoken utterances): sentences are a phenomenon of written and not spoken language.] We will come back to this example utterance later. At the same moment as you are hearing this utterance, in Amboseli National Park in Kenya, a group of vervet monkeys is foraging on the ground near a large baobab tree. A young male on the periphery of the group suddenly stands on his hind legs and gives a loud triple barking sound. The other monkeys have no doubt what this means: a snake is in the vicinity. The monkeys group together, scouring the grass for the location of the predator. In both these scenarios, a primate brain performed one of its most remarkable tricks. It took a pattern of vibration off the air and turned it into a specific set of meanings. The monkey example is interesting because it has been seen as a model of the early stages of human language. 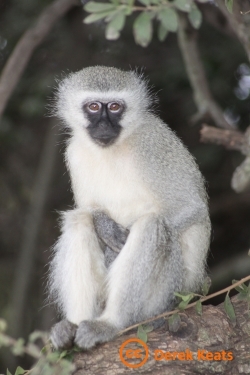 Vervet monkeys have several distinct alarm calls – snake, leopard and eagle are the best studied – each one of which can be said unequivocally to have a meaning. We know this because, on hearing an eagle call played back by a researcher’s tape recorder, the monkeys scan the skies, whilst when a leopard call is played, they climb a tree (Seyfarth, Cheney and Marler, 1980). Thus quite different associations are evoked in the vervet brain. The computational task for the human brain in understanding utterance (1) is vastly more complex than the vervet case, at every level. It is so complex that a whole field of research – linguistics – is devoted to investigating what goes on, and it requires a whole set of brain machinery that we are only beginning to identify. Hearing and understanding a complex utterance, or the reverse, where a thought in the brain is turned into a string of buzzes, clicks and notes we call speech, is the crowning achievement of human evolution and the defining feature of human mental life. No other species that we know about comes even close. The vervet monkey call system, as we saw, involves a mapping between sounds and meanings, just as human language does. However, it differs from human language in two crucial respects. The first of these is called generativity. The three major vervet calls – snake, leopard and eagle – are meaningful units in their own right; you do not need to say anything else, you just call. The calls cannot be combined into higher-order complexes of meaning. A snake call followed by a leopard call could, as far as we understand it, express only the presence of a snake and a leopard. It could not express the proposition that a snake was at that moment being hunted by a leopard, or vice versa, or the idea that leopards are really much more of a nuisance than snakes. This means that the number of meanings expressible in the vervet system is closed, or finite. There are only as many meanings as there are calls. Human languages, by contrast, allow the recombination of their words into infinitely many arrangements, which have systematically different meanings by virtue of the way they are arranged. In the vervet system, the monkeys can simply store in their memory the meaning associated with each call. Human language could not work this way. Let us now reconsider the complex utterance you heard in the imaginary scenario at the beginning of this article. Here it is again. You have almost certainly never heard (or read) this exact utterance before. In fact, it is possible that no one, in the entire history of humanity, has ever uttered this previously. Yet we all understand what it means. We must, therefore, all possess some machinery for making up new meanings out of smaller parts in real time. This is what is known as the generative capacity of language; the ability to make new meanings by recombining units. The vervet system is not generative, whereas human language is. Vervet calls are indivisible wholes; they cannot be analyzed as being made up of smaller units. Words, by contrast can be broken down into smaller sound units. Thus language exhibits what is known as duality of patterning (Figure 2). At the lowest level, there is a finite number of significant sounds, or phonemes. The exact number varies from language to language, but is generally in the range of a few dozen. The phonemes can be combined into words fairly freely; however there are restrictions, known as phonological rules (see Phonology), about how phonemes can go together. Words in their turn combine into clauses (simply put, these are groups of words containing a lexical verb, such as ‘the boy hugged the dog’ and ‘give me the book’). However, as we have just said, not all combinations of words are grammatical. Which combinations are allowed depends on syntactic rules. There are some differences between the higher and lower levels of patterning in language. Phonemes, the basic unit of the lower level, have no meaning at all, whereas words, the basic unit of the higher level, typically carry meaning. The meaning of the word bed has nothing at all to do with the fact that the phonemes making it up are /b/, /e/ and /d/. [See Transcribing Speech for an explanation of the / / notation.] If you change one phoneme, for example the /d/ to a /t/, then you have a word that is not just different but completely unrelated in meaning – bet. You could imagine a hypothetical linguistic system in which particular phonemes had special relationships to meanings; for example, in which words for furniture all began with /b/, or words for body parts all contained an /i/. No human language is like that, however. You cannot predict the meaning of a word, even in the vaguest terms, from the phonemes that make it up. The higher level of patterning is quite different. The meaning of a clause, for example, is largely a product of the meanings of the individual words that it contains. Syntactic rules serve to identify which word in the clause plays which role, and the relationships between the words. Consider these examples. (2) The cat bit the dog. (3) The cat which was bitten by the dog was thirsty. 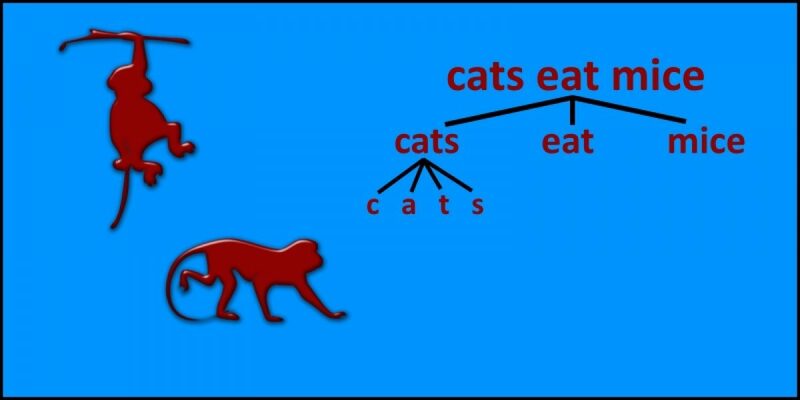 In (2), we know that the cat was the biter and the dog the bitten because of a pattern in English syntax which says that the first noun is generally the subject of the clause. In (3), there are two possible participants to which the state ‘thirsty’ could be attached – the dog could be thirsty or the cat could be thirsty. The syntax tells us that it must be the cat. Without syntax, no one would be able to tell who was biting, who was bitten, and who was thirsty in (2) and (3), however much they knew about the behavior of cats and dogs. Seyfarth, R.M., Cheney, D.L. and Marler, P. (1980) ‘Monkey responses to three different alarm calls: evidence for predator classification and semantic communication’ Science 210, 801-803. Image ‘Vervet monkey’: Derek Keats in Flickr made available under Creative Commons Attribution 2.0 Licence.